War is an American funk band, formed in 1969 and originally fronted by British singer Eric Burdon. The second album from the union of British singer Eric Burdon and the band War was released in 1970, close on the heels of their debut. It was a double LP set, sprawling and experimental like the most notorious double albums are. 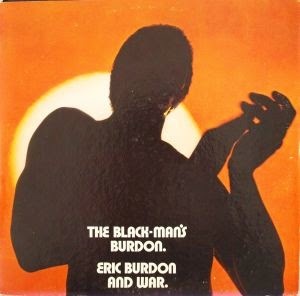 The Black-Man's Burdon is the sort of record that will always divide listeners - some will love it, whislt many will call it tedious and overindulgent. It featured covers of The Rolling Stones' "Paint It Black" and The Moody Blues' "Nights In White Satin", the first in a 10-minute multi-part suite, and the second appearing twice within the first half of the album. Elsewhere it featured lots of instrumental jamming overlaid with Burdon's rambling and shouting. The focus was starting to shift towards the awesome funk-jazz-R&B backing of War, and Burdon's role in the ensemble was becoming questionable. This was best exemplified on the closing track "They Can't Take Away Our Music", where the members of War sang and proved themselves to be excellent vocalists (released as a single, it got to #50). The union wouldn't last much longer, and Burdon left the group during a European tour. By 1971 they had begun recording as just War.